Much has been said about the foreign invasion into the upper ranks of O-sumo lately, but another significant phenomenon � maybe even more significant �is the growing number of former university champions reaching the top divisions. In this article we take a close up look at one of the most famous university sumo clubs, Nichidai (short for �Nihon Daigaku�, which means Japan University), its former champions and their O-sumo performances. We�ll also check out some of its bright prospects. On the last banzuke, for the Kyushu Basho, there were 19 former university wrestlers in the Makuuchi division, (the 42-rikishi elite of sumo wrestling). That figure has been constantly increasing, albeit slowly during the last five or six years. In the near future, most top-ranking professional fighters are likely to be former college wrestlers. That evolution, in combination with the increasing success of fighters from Eastern Europe and Mongolia, worries some officials at the Sumo Federation (Nihon Sumo Kyokai � or NSK). They believe that �sumodo� (a wrestlers style and mental disposition, inherited from the samurai�s �bushido� traditions) could be endangered. Among the 19 wrestlers mentioned, five were former champions of one of the most renowned university sumo clubs, Nichidai University: Komusubi Kotomitsuki (who fought as an amateur under his real name, Tamiya) and Maegashira Takamisakari (Kato) �the most popular rikishi in Japan � Hayateumi (Saito), Kaiho (Kumagai) and Futeno (Uchida). Four other ex-Nichidai are now sekitori, in the Juryo division: Otsukasa, Yotsukasa, Daishodai and Hamanishiki. On the whole, 22 former Nichidai students have reached the highest division. The first of them, Wajima, is also surely the most famous. He was a yokozuna in the 70�s and won no less than 14 yusho in Makuuchi (which makes him the fifth best rikishi since the six-basho-season calendar was set), before retiring in 1981. Kotomitsuki is the only other former Nichidai student to have won a yusho. Like other former students of the university such as Arase, Dewanohana, Tochitsukase, and his teammate and rival in the end of the 90�s, Hayateumi he reached Sekiwake. That group, including Tamiya (two University Yokozuna titles in a row and two amateur Yokozuna titles in a row) and Saito (one university Yokozuna title), but also Takahama (now fighting in O-Sumo with the shikona Hamanishiki) and Kato (one amateur Yokozuna title), won every amateur title between 1996 and 1998, including in the world championship. 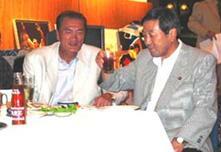 This extraordinary success is due to one man: Mr. Hidetoshi Tanaka. He was already there when Wajima was fighting, and won the amateur sumo championship twice. Under his direction, Nichidai�s sumo club has developed training techniques, similar to the ones used in O-sumo, but focusing more on muscle development than the professional tradition. The way of life in the club is said to be rather austere, comparable even to what can be seen in the closed world of the heya. In the Kyushu Basho, former Nichidai students in Makuuchi performed very well (particularly Kotomitsuki and Kaiho), but those in Juryo had a hard time (especially Hamanishiki, who will lose his sekitori status). In the lower divisions, the great yusho (makushita and sandanme) achieved by Shiraishi and Yamamoto will certainly have pleased Mr. Tanaka, as well as the repeated performances of Satoyama and Kurazono, both former prot�g�s. These young deshi (only 17 basho between the four of them) will already be in the Makushita division on the next banzuke! Still, Mr. Tanaka gets his greatest satisfaction from the dream team he was able build up this season. They started by winning four titles in the Japan university championships weight categories, last October, in Osaka (Hanada � under 85 kg, Yoshida � under 115 kg, Shimoda � under 135 kg and Ryuichi Yamamoto, 1.90 m and 195 kg, openl categories). In October, they made up the entire Japan team for the world amateur championships in Riesa, and were successful in team and individual categories in middleweight (Yoshida), heavyweight (Ichihara, 1.82 m and 157 kg) and open categories (Shimoda). Nichidai's team then confirmed its supremacy in Japan during the university championships at the Kokugikan, at the beginning of November, winning by some distance, even though the young giant Yamamoto did not participate! The only (great) disappointment is that Hakiai, from Kinkidai University, beat every single Nichidai fighter (Mori, Yoshida and captain Sakaizawa were all in the semi-finals) and got the university Yokozuna title. Now, only the national amateur championships remain on the 12th of December. There is a good chance that one of Nichidai�s fighters will become an amateur Yokozuna thereby gaining direct access to the Makushita division. However in order to do so, they will have to beat, among others, title holder Kato, formidable Hakiai and Nakanishi, the exceptional highschool Yokozuna Sawai, and company Yokozuna Maeda. (*): At the time of publication the results were unknown. They will appear in the next issue of the Petit Banzuke Illustr�.